Smooth lightweight fabrications, feminine silhouettes, and bright hues basically sums up my entire closet. 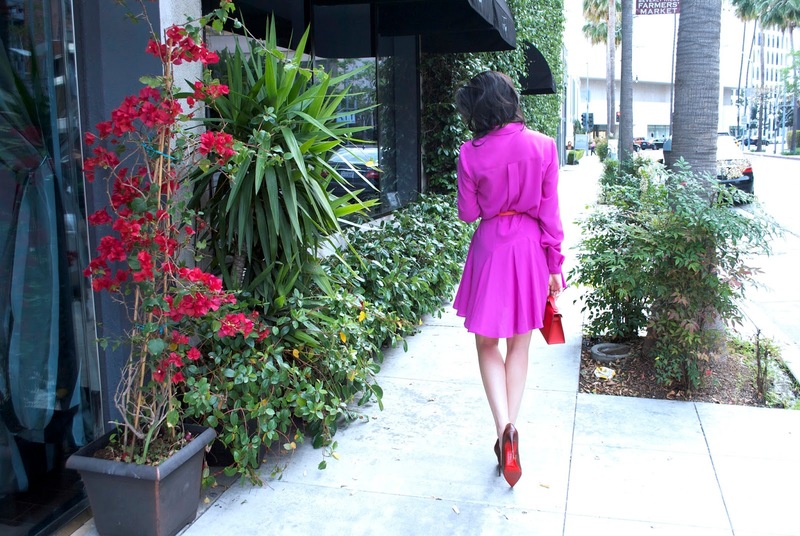 This silky magenta piece from Trina Turk, projects a springy, playful vibe with a hint of lady-like elegance. Since the midi dress lacked a true waistline (a slight setback for girls with smaller frames), and I was too lazy to head to the tailor, I accessorized with a thin belt to define the waist and shorten the original hemline. A cinched waist also marks the beginning of your leg line, hence creating the illusion of longer legs. For afternoon brunch in Venice, I slipped into a pair of pointed louboutins, and completed the look with the newest addition to my purse collection~a Kelly Pochette. I easily transitioned the day ensemble into a night out number with platform heels, bold earrings, and lush lashes! Wow, who took these wonderful pictures for you?!!! You look as beautiful as always :)) I like the pink dress and red purse a lot. Hope you can post some pics by the beach next time. Your secret admirer #10.